The Entangled Publishing Indulgence line is one year old on February 12th 2013. There's going to be a great big party to celebrate – everyone is invited! There will be prizes, chat and games and chances to win ALL the Indulgence titles, meet some of the authors and generally indulge yourself. Want to get your hands on ALL the Indulgence books? Well, this month you can! When : February 4th – February 28th (Weekdays). Time : 9pm – 10pm EST. Where : Twitter! If you’re not following us yet, follow now at @indulgencebooks ! Hashtag : #IndulgeYourself. 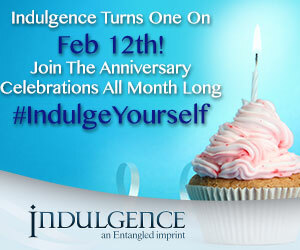 How : Starting February 4th, follow the #IndulgeYourself hashtag on Twitter! We’ll be tweeting clues, you need to figure out which Indulgence book the clues refer to and a random winner gets a copy of the book! For reference, you can find a list of all our Indulgence titles here! You can refer to this list when we give out the clues. Not bad, eh? And there’s more! :On February 12th, we’ll be hosting a Grand Prize Giveaway full of Indulgent Goodies, over on the Entangled blog! Don’t miss it!